The people who set up a Facebook page to look back and celebrate a town’s history and heritage are proud to have reached the milestone of 10,000 likes. Wellingborough Now & Then is an archive of photos and stories where people can reminisce, share tales and catch up with old acquaintances. The majority of its posts are pictures, which are archived into albums so people can easily find what they are looking for if trying to learn more about the town’s past. But it also provides a forum to people to share stories, memories and anecdotes from years gone by. Andrew Law, who set up the page six years ago, said: “I was a member of another group in London and enjoyed that group so I thought let’s do something for Wellingborough. “There was nothing for Wellingborough at the time, there were no Spotted pages then, and it just went from there. “It has turned into a community group now. “Most of the old pictures are of postcards from eBay, from books and newspaper cuttings and then people put their own up, which I think are the best ones. “We have just got 10,000 likes on Facebook. Andrew said he loved the old stories which people post on the page, and added: “We have got a man called Fred who is in his 90s and he’s got some great stories. One of the most recent posts on the page is a picture of Queen Victoria’s Golden Jubilee celebrations in Silver Street from 1887. He said the reaction to most posts is postive, although it can get a little heated if links to planning applications or issues which divide opinion are posted. 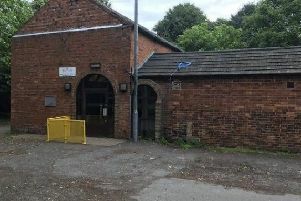 The Facebook page played an important role in promoting a petition which was launched in 2014 to save the town’s former Drill Hall. Several hundred people signed the online petition asking Wellingborough Council to ensure the safe keeping of the Drill Hall and that it remains part of any future development of the site. Andrew spends between one and two hours each day putting new posts online and archiving photos so the site is easy to use. But in order to retain its original aim of being a page for a nostalgic look back at Wellingborough’s past, he also has to regularly check what has been posted in his role as administrator for the page with Colin Armstrong. To see the page, search for Wellingborough Now and Then on Facebook.